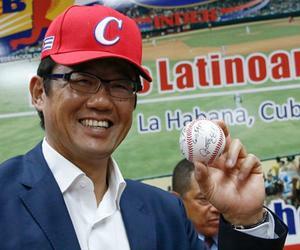 Atsuya Furuta, a member of the Japanese Baseball Hall of Fame, stressed the importance of relations between his country and Cuba in this sport at a lecture he gave at Latinoamericano stadium, in this city. We have done a lot for baseball and we can do more, "he told JIT sports publication, after talking on Thursday about the structure and specificities of the Japanese Professional League (NPB) and its relationship with Major League Baseball (MLB). In this way, the former catcher and emblematic figure of the Tokyo Yakult Swallows began a three-day visit to Havana. During his stay in Cuba, Furuta will meet with sports glories, talk with journalists, offer a children's clinic and visit the Cuban Sports Research Center and the Havana Anti-Doping Laboratory, among other facilities. Before more than fifty local coaches, he referred the causes of development of baseball in the Japanese archipelago, double champion of the World Classic in 2006 and 2009. Among the highlights he included the importance of discipline in and out of the field by the athletes, from the beginning of the second or third grade, as well as some frequent issues in baseball of his country, given by the physical build of athletes. He illustrated that topic with data indicating that the player in the MLB has an average height of 187.8 cm with 86.5 kg of weight, while those of the NPB are in 180.4 cm and 82.8 kg. He noted that in an MLB season, each team averaged 34 sacrifice bunts; while in the Japan was of 114. He considered that Japan's starting pitcher against Cuba on March 7 in Tokyo in the opening match of group B of the 4th World Baseball Classic is between switch hitter Shohei Otani and right hander Tomoyuki Sugano. Rodolfo Puente, director of the Cuban Baseball Federation, and Jesús Barroso, head of training of the National Baseball Directorate, offered the visitor details of Cuban baseball, its organization, operations, recruitment of talent and the National Series. Furuta participated in 18 seasons, with batting average of .294, 2097 hits, 217 home runs, 1003 runs, 1009 RBIs and a slugging percentage of .442. He was also the Most Valuable Player of the regular season in 1993 and 1997, won that same prize in the Japan Series in 1997 and 2001, and was also the MVP of the Stars Series twice (1991-1st game and 1992-2nd game). He won a dozen Golden Gloves, four awards MVP of the month and was elected nine times to the best-nine team of the season, emphasizes Radio Habana Cuba station.